The Leicester Codex, also known as the �Hammer� Codex from the name of the American millionaire who owned it before Bill Gates, was compiled between 1506 and 1513, during the period when Leonardo was dividing his time between short stays in Florence and returning to Milan, this time under the protection of the French king, Louis XII. 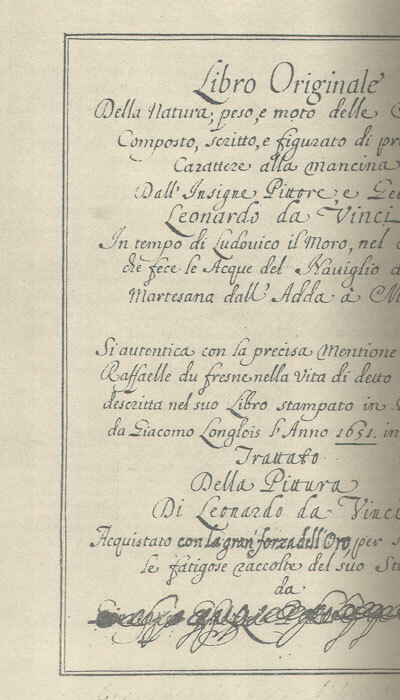 Unlike the other manuscripts where the subject changes on each page according to Leonardo�s mood or his innumerable interests, this codex is almost totally dedicated to an in-depth study of a sole theme: the study of water. Currents, whirlpools, waves, heads, canals, banks, locks, dams, tunnels, projects for docks, for land reclamation, lists of machines for making use of the energy supplied by water and projects for the use of water for military purposes, take up most of the illustrations, accompanied by texts dense with theories, propelling that great leap forward which science was to make from the Renaissance on. The Leicester Codex was almost certainly not part of the group of manuscripts inherited by Francesco Melzi (1493-1570), since nowhere on it can the unmistakable annotations and abbreviations of the heir, so frequent in the other codes, be seen, but certainly belonged to the sculptor Giovanni della Porta (1500-1570), one of Michelangelo�s pupils. Sold by the heirs of della Porta to the painter Giuseppe Ghezzi (1634-1721), it was sold by the latter in 1717 to Thomas Coke, the Count of Leicester, whose family kept it in the library at Holkham Hall for 263 years. Auctioned in 1980, the codex was bought by the American magnate Armand Hammer and at his death, purchased by Bill Gates, the founder of Microsoft.